A few days ago, I was in line at the check out, waiting my turn to unload my cart, when my eyes wandered over the many, many tabloids and what passes for investigative magazines. Incredibly, I had not heard of most of the people that grace the glossy covers. Ok, maybe not incredibly since I am a hostage to the Cartoon Network. If it’s not animated, I don’t know about it. But I had to stop and stare to read one magazine cover, twice. This made me a bit sad. I remember when we first moved to the US, being a new kid in school, and how every kid in my class came up to me to greet me, be it with “Hey, you’re new here?” or “My name is Amy and you can be my friend” or a few kids saying “Watch this!” It wasn’t hard to meet new kids. As I grew older it was more subtle, but it was still relatively easy to meet people. College made an art of it, what with “mixers” and frat parties and ice cream runs. 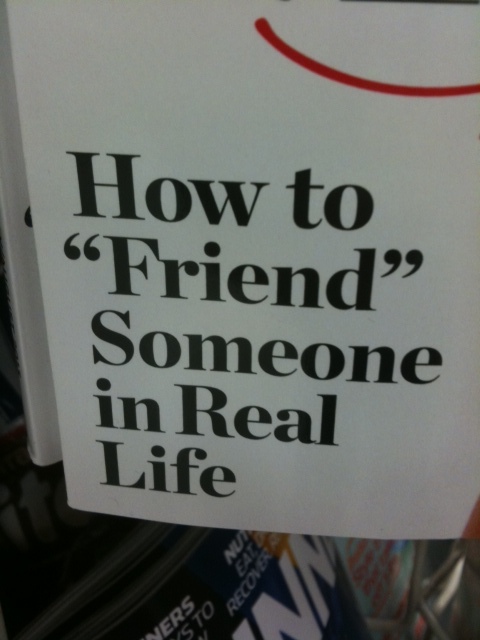 But I don’t remember having to read about how to make friends. Yes, I recall a book along those lines. But my issue here is how disconnected we have become from the physical and how connected we are in the technological. I admit to having plenty of online friends, met through the magic of the internet. And I am grateful for each and every one of them. But it’s a sad state when someone feels the need to publish a guide on social interactions that we should still remember from Kindergarten. This entry was posted on Sunday, July 14th, 2013 at 10:41 AM	and tagged with all-growed-up, hard-things, live-like-you're-dying and posted in Randomness. You can follow any responses to this entry through the RSS 2.0 feed. Real life? Is that a “Thing”? Maybe it is a good sign. Look how long we’ve gone where no one really even recognized or lamented the loss. Reality: there’s an App for that. Best place to meet friends was always during crafts-time. Yup…pull up a pillow, kick back and eat paste with fun and interesting folks. Good times…good times. being a former Army brat, I think it was easier growing up making friends because we all were “new” to a post at one time, and as that friend left, others replaced them. I had a similar experience, since my mom was a teacher and we moved to where the job was. Then came our move here, and redistricting schools kept me moving from one to another almost every year. A truly sad commentary on how far society has disintegrated. Technology has brought me a lot of new friends too but there is nothing like in person interaction…..